Experiential (practising skills in a particular context or undertaking an investigation). 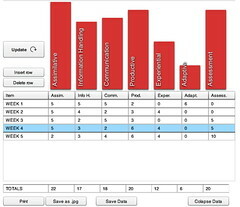 In addition the tool looks at the spread of assessment acros the course or sequence of learning activiites. Use this exercise to visually map the activities that students will engage in through a unit, module or course, and get a working experience of what the graph might tell you about the spread of types of activities you have designed for. An activity, module or course to experiment with. 1. Who might be interested in seeing this view? 2. How useful might it be to compare your chart with other people's pedagogical profiles (you can do this with by embedding Flickr images of you charts below) What might this comparison tell you? 3. (For support teams) How might this graph help you talk to course teams about the resources, advice, activities and tools you have on offer?